Pilot whales are plentiful on both coasts and are usually seen at the beginning and end of the year. Visitors are most likely to see Bryde’s whales during travel to Costa Rica between January and April. Orcas, seis and sometimes blue whales from the north also pass through the waters of Costa Rica. To learn where humpback whales and dolphins are found in Costa Rica, see our articles on these species. Several national parks dot Costa Rica’s Pacific coastline. South of the country’s most popular park, Manuel Antonio National Park, is another popular attraction, Marino Ballena National Park, named for the whales. Though visitors are more likely to see humpbacks here, it is also a place where sperm whales are observed. Further south, the Osa Peninsula offers many whale watching opportunities. Corcovado National Park comprises almost half of the peninsula. On the ocean side of the Osa Peninsula in Drake Bay is the Isla del Cano Biological Reserve. Sperm whales may be seen in the waters off the park, most likely in December and January, and blues, coming from the north, pass by sometimes. Four of Southern Explorations’ guided Costa Rica tours and two of its self-guided Costa Rica trips include leisure time along the Pacific coast in the region where whales are found. These include the seven-day Coast to Coast tour, the eight-day Rainforest and Beaches and Rainforests and Volcanoes tours and the ten-day Classic Costa Rica trip as well the self-guided eight-day Adventure Fly and Drive and the Classic Fly and Drive tours. These fly-drive trips easily accommodate whale watching at these parks. Among the country’s cetacean attractions, the humpback whale is the species that most people travel to Costa Rica to observe. The fifth largest of the rorqual whales, the humpback is an unforgettable site, growing to fifty-two feet in length and weighing up to fifty tons. It has a narrow snout, with fourteen to thirty-five throat grooves on its underside and a huge jaw that contains 330 pairs of baleen plates. Is dorsal fin is small and the flippers measure a third as long as the body. Humpbacks may be gray, black or mottled, and are mostly white on its flippers and underside. Because the white markings on the underside of the flukes are unique, scientists can identify and study individual whales. Bristled growths protrude from its head. Whale watchers on Costa Rica tours may notice the humpback’s twelve-ft long flukes with scalloped edges before the species dives. The species produces a bushy blow and breaches so powerfully that the humpback may lift most of its body above the surface of the water, the maneuver for which it is named, and an amazing sight that visitors on Costa Rica tours will always remember. When people think of whale sounds, it is usually the humpbacks they have in mind. The humpback’s songs are the most complex of any of any whale species and longer, lasting twenty to thirty minutes. Humpback males sing, scientists believe, as a mating ritual, but where those sounds come from is not fully understood, since the species has no vocal cords and does not appear to open its mouth or exhale while emitting tunes repeated over days of presumed wooing. Humpbacks feed cooperatively. Using a technique called “bubble net feeding,” they dive some fifty feet below the surface and create a huge net of bubbles, circling toward the surface which entraps krill. The species eats between 4,000 and 5,000 pounds of food a day during its four-month feeding season. Though the humpback can dive as deep as 700 feet, it spends most of the time in shallow water. Each dive usually lasts between fifteen and thirty minutes. The humpback usually swims three to nine miles per hour and half that while feeding. It is its slow pace in coastal waters while feeding that made the humpback an easier target for whalers than the faster swimmers. Humpbacks live in temporary pods, breeding every two years. Gestation lasts twelve months. The humpback species’ lifespan is forty to fifty years. Wherever there are humpbacks, you will usually find orcas, their primary predator, though sharks may attack young humpbacks as well. The humpback received international protection in 1963, though killing of whales for “research purposes” is still sanctioned. Humpbacks travel to Costa Rica from the world’s polar waters to breed and give birth, migrating from the Arctic migrate as far south as Venezuela and from Antarctica as far north as Costa Rica. 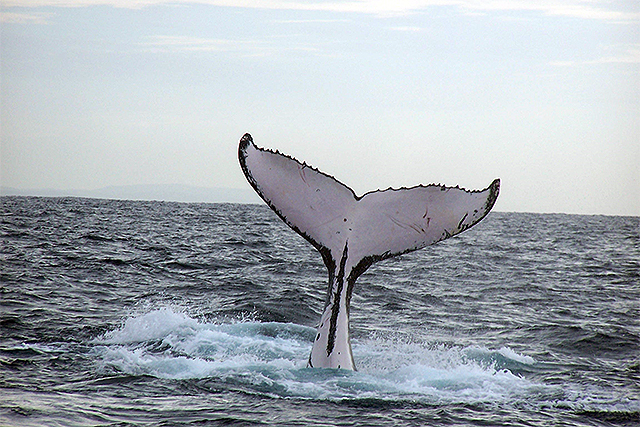 During certain periods, visitors on Costa Rica tours will see humpbacks that have migrated from both poles. The peak months for viewing humpbacks are December to March and July to November. Marino Ballena National Park, on the Pacific coast, is named for the whales it protects, and a good spot for visitors who travel to Costa Rica wishing to see humpbacks. Further south between the Osa Peninsula and the mainland, humpbacks may be seen during the dry season in the Golfo Dulce off the shores of Puerto Jimenez. Humpbacks may also be observed out to sea in Drake Bay, near the Isla del Cano Biological Reserve. Four of Southern Explorations’ guided Costa Rica tours and two of its self-guided Costa Rica trips include leisure time along the Pacific coast in the region where humpbacks are found. The guided trips are the seven-day Coast to Coast tour, the eight-day Rainforest and Beaches and the Rainforests and Volcanoes tours and the ten-day Classic Costa Rica trip; the self-guided tours are the eight-day Adventure Fly and Drive and the Classic Fly and Drive.